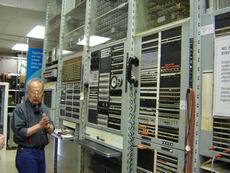 The third floor of the Museum of Communications houses telephone switching equipment, old teletype equipment, and other old artifacts. The following is a picture gallery of the third floor. 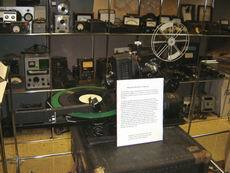 Magnetic recording technology has been around for a number of years. 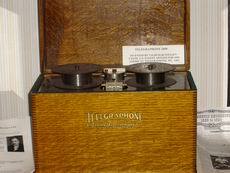 The first practical uses were magnetic wire recorders. 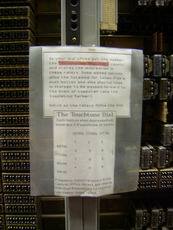 Please leave your message after the tone.. tone� tone.. tone. 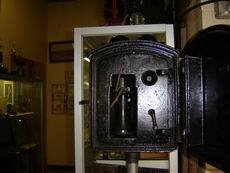 This is an early answering machine (Western Electric made, of course). 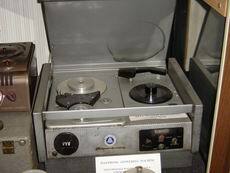 The outgoing message was on a 45 RPM record, the incoming message on magnetic tape. 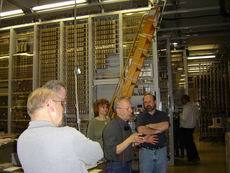 This is also from the �you�ll never know what you�ll find� department. 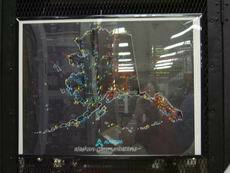 This is a poster for Alascom, which was at one time the name of the largest telephone company in Alaska. Since this time, Alascom has been bought out at least two or three times. 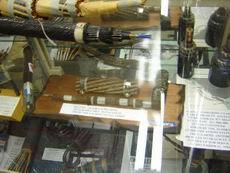 Underwater cables have been a challenge for many years. 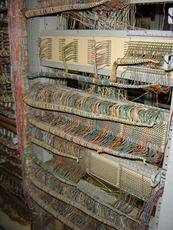 Here are some early examples of how telephone engineers of yesteryear were able to meet the challenge. 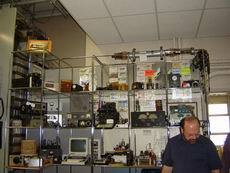 Old computers and radios. 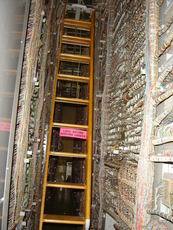 Hey Bruce � is your old CB radio in this stack? Can you wash me now? 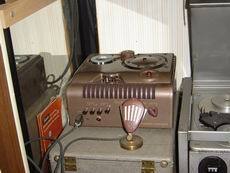 Again, Western Electric branched out and even did home appliances. 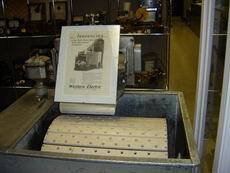 This is an old washing machine from around 1920. Can you hear me now? Now? And again? 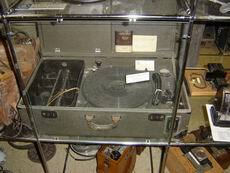 Here�s an old hearing test kit that used phonograph records to create the tones, instead of electronically. Nooooooo! 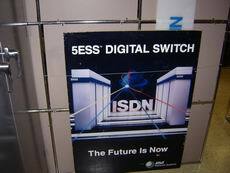 A sign for the (then) forthcoming 5ESS switch. 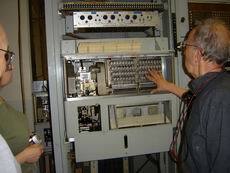 Basically the bread and butter digital end office switch that Western Electric introduced in 1982 and Lucent still makes to this day. Before the invention of the photoelectric cell and films with emebedded soundtracks, here�s an experimental soultion � using a phonograph record with a projector. I�m not sure how they were synchronized, if at all. 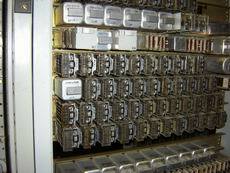 FINALLY � the telephone switches. Unfortunately, I didn�t take any pictures of the Number 1 Crossbar (#1XB) or Panel, but I took a number of pictures of the Number 5 Crossbar (#5XB). 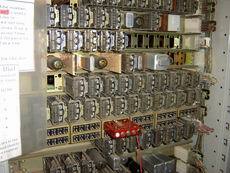 Relays associated with the #5XB switch. 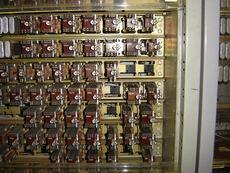 The relays associated with the incoming register. Look at all the cabling inside all those racks! Here�s the test board for the #5XB. 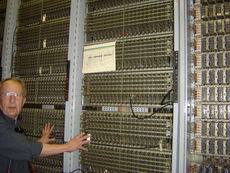 I made a few calls from here to the #1XB and Panel switches. 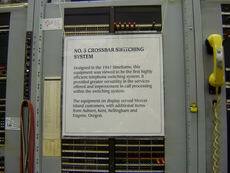 To the left of the picture is the #1XB test board. 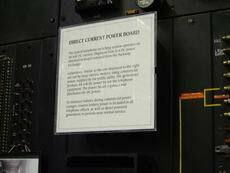 The Direct Current Power Board. 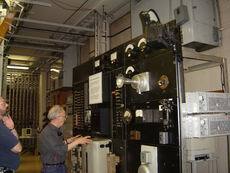 How are you able to control the electrical power required for a large central office? Very carefully! At 48 volts DC and over 1000 amps, this system controls the power board for adding additional batteries when the main AC power goes out, without short circuiting the system while batteries are added or removed, or adding or removing the emergency generator from the system. 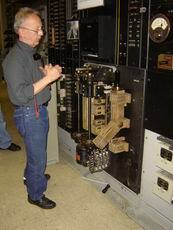 A small cord board operator station. An emergency phone for use by the police. 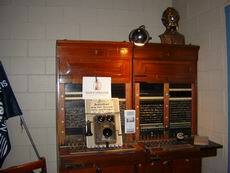 This was used before there were radios in police cars.